When April Collins was still in high school, she visited her tiny, newborn niece in hospital. The experience sparked a passion which has continued to shine – a passion to help bring new life into the world. “I’d actually always been interested in becoming a midwife, but it was seeing my premature niece in the neonatal ICU and then later witnessing the birth of one of my nephews, which really solidified what I wanted to do,” she said. Now, nine years on, April’s dream has become a reality. A Kempsey local and proud Wiradjuri and Dunghutti woman, April will join her cohort on Tuesday, 5 February to celebrate the culmination of her studies as the first Indigenous graduate of the Port Macquarie Bachelor of Midwifery program. One of more than 80 graduates to complete their studies across a range of disciplines at the University’s Port Macquarie campus, April acknowledged the use of ground-breaking technology as a key part of her training. “We used the virtual reality program to practise neonatal resuscitation when it was introduced in my final year. Although I was undertaking placement at the hospital by then, it’s a great tool to practise before you head into the field, especially for first year students,” April said. “For our degree we’re required to witness five births, deliver 25 normal vaginal births, assist in a minimum of five caesarean sections and take part in 15 complex births where the mother presents with complications. I’ve lost track of how many deliveries I’ve taken part in though – it’s a lot more than that! With the strong support of her family, April is committed to giving back to the community that inspired her to reach her goal. “It felt really important for me to give back to my Dunghutti community in Kempsey. 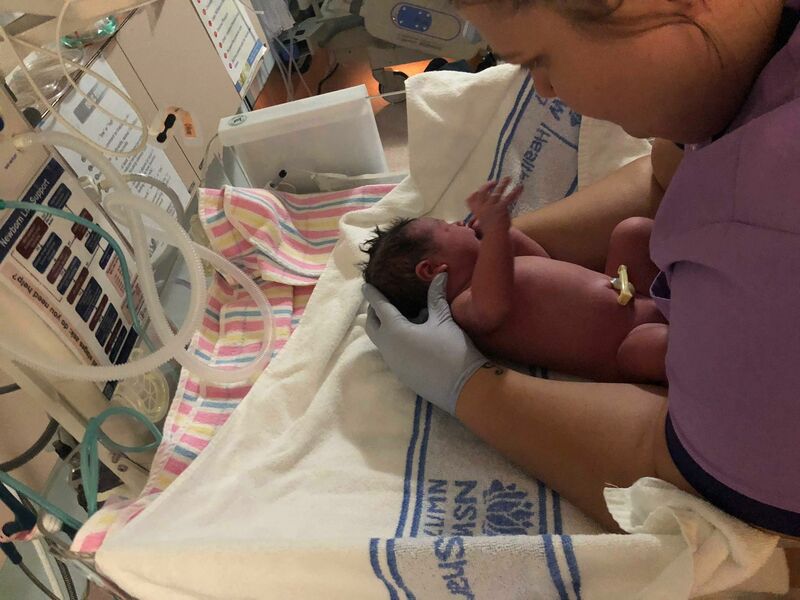 I originally started as a student midwife at Port Macquarie Base Hospital, but was granted a transfer to Kempsey District Hospital and was able to spend three years there. “I think it’s been good to have someone from the local community working there, as there have been situations where I’ve been able to connect with Indigenous mothers or have conversations which may have been tricky for those without the cultural knowledge. “It’s also been an incredible experience as I’ve had the opportunity to deliver the babies of people I know or went to school with, and even my own nephew, which was really special,” April explained. Continuing her journey in regional Australia, April will start her first day on the job as a graduate midwife in North West NSW the day before her ceremony. “I’m looking forward to a new adventure and getting more experience elsewhere, but ultimately I’d love to come back home and continue my work with the community in Kempsey,” she said. University of Newcastle Vice-Chancellor, Professor Alex Zelinsky AO, said April’s story was a testament to the dedicated students choosing the support of the University of Newcastle to achieve their goals. “April’s commitment to giving back to her community is a wonderful example of our students working to make a difference,” Professor Zelinsky said. “Reaching graduation is a significant milestone for all our students, their families and the University. It’s the culmination of a lot of hard work and dedication, and a moment to be incredibly proud of. The Port Macquarie graduation ceremony will take place at 1pm on Tuesday, 5 February at the Glasshouse.